Lemonade Stand: 10 DIY Lemonade Stand Ideas. 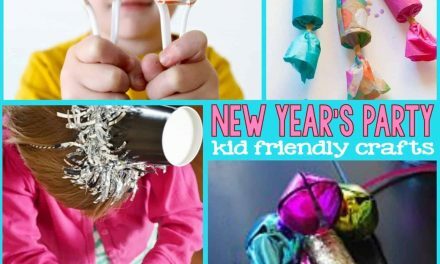 Looking for a fun activity for the kids to keep them busy (or just out of your hair)? How about a DIY Lemonade Stand? 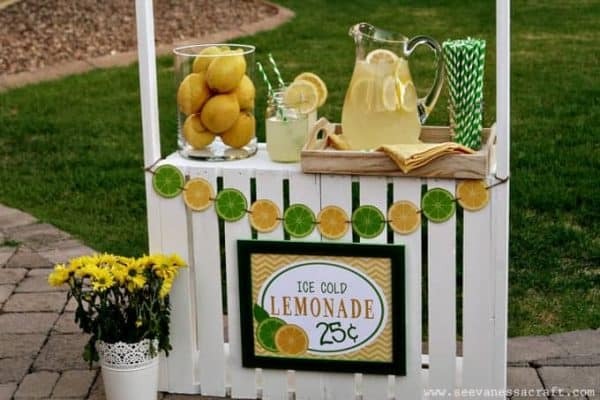 Looking for more lemonade stand ideas? Check out this fun lemonade party, this strawberry lemonade stand, this strawberry shortcake recipe and these strawberry treats. This lemonade stand is stunning! I love the colors and the details. I especially love the way the lemon is worked into so many of the treats. Love it! My favorite detail is probably the doily wrapped glass jars (see below). 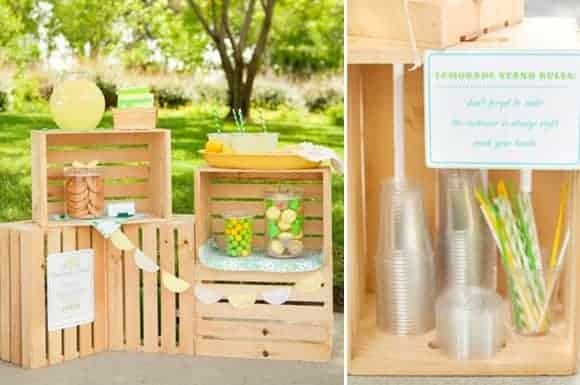 This lemonade stand is simple and chic. It would be a great twist (pardon the pun) for a boy’s lemonade stand. I love the green touches as well. I’m a firm believer that you can NEVER have too much pink. 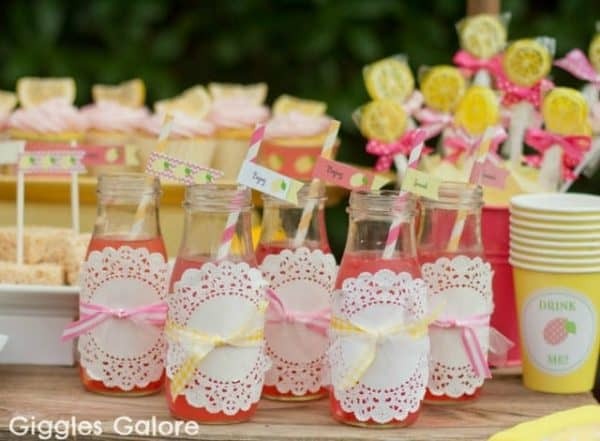 This adorable pink DIY Lemonade stand birthday proves me right! I LOVE, LOVE, LOVE the mini stand on the table. Too much! Perfection…so clean, yet with a rustic touch! This is such a sweet party. I adore the little banner strung between the lemons and the easy spring feel of the design. These pcitures just scream “warm spring day”, don’t they?? 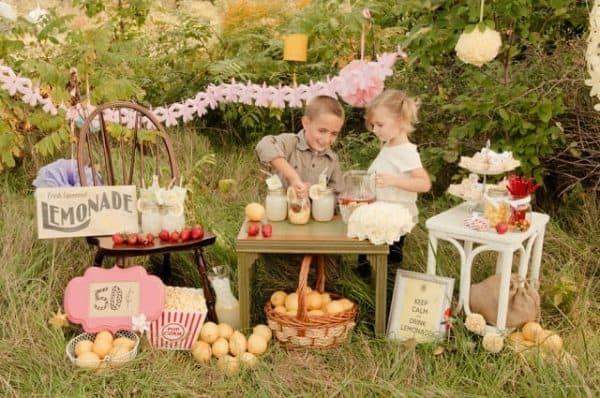 This lemonade stand is adorable and vintage. I love how it feels like a little romantic date, but in a cute alfalfa/darla way. Precious. The vintage signs are the perfect touch. 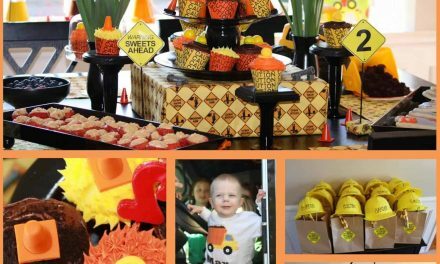 One of my all-time favorite little parties from one of my favorite blogs. 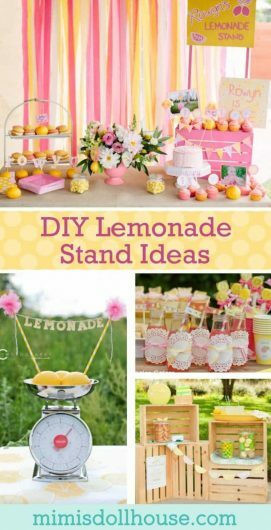 This classic, easy to replicate DIY lemonade stand would be great for a little weekend diversion without breaking the bank. I love the green and yellow details. This is a fun Lemonade Stand with a modern twist. I like the inclusion of the ever popular “Keep Calm” Sign and the pretty color palette. Adorable, right. 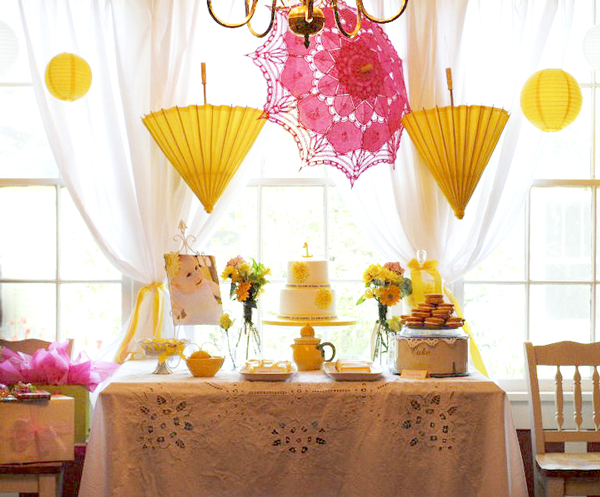 How sweet is this vintage, burlap lemonade banner? I love the sweet, subtle details of this stand. The colors are soft and the pictures are stunning. 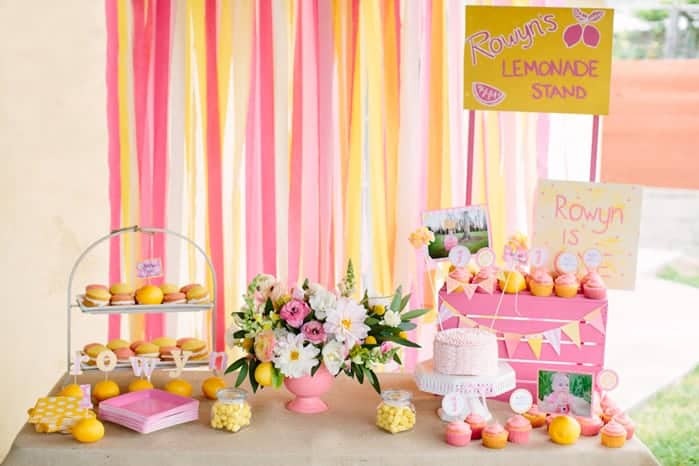 If subtle pink is not your thing…this is the lemonade stand for you. I love the bright colors and the bold decor. The contrast between the bright pink and yellow and the white is gorgeous. Definitely a wow party! And last, but certainly not least…I am in love with the umbrella in this party. Just a beautiful display. I love the colors and the bright open feel of the room. Beautiful! Adorable ideas, aren’t they!! Hopefully they inspire you to put together a little lemonade party of your own. As always, I’d love to see the pictures, or you can submit your party for feature! I wish I had a lemonade stand like this when I was little. I might of made more money! LOL! So cute! My now 9 year old had a lemonade stand a couple of years ago at my parents’ house. It was impromptu and she and her bff made the most disgusting drinks, and they live in the country on a mildly busy road with a 50mph speed limit, but they were so dang cute that a few people stopped and turned around to buy their goods. My daughter and step son (9 and 10) are always wanting to sell things in front of our house. We live in a small cul de sac with mostly elderly people, so we don’t get much traffic coming through, but this would be really fun for them! I’m wondering if its too late for me to switch careers, but I’m sure with stands as cute as these, I would be too busy taking and posting photos to actually make a sale, ha ha! I set up a snack stand while my mom had yard sales, but they were never this involved! 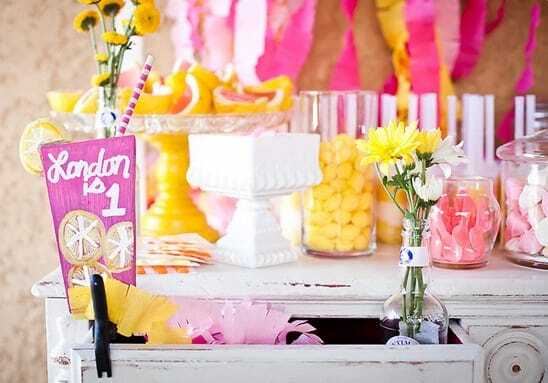 Also a lemonade stand themed birthday party is such a cute idea, especially for warmer months! 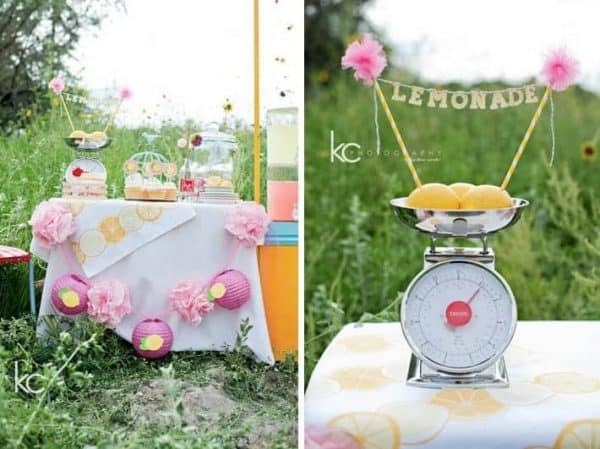 I love the idea of a lemonade stand for the summer and these ideas are so cute and creative! I really like the look of the printables too a lovely idea. 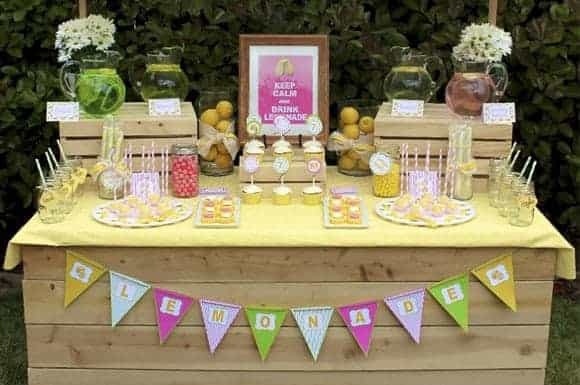 Lemonade stands are such a cute and fun idea for the little ones. I might try this during the summer. 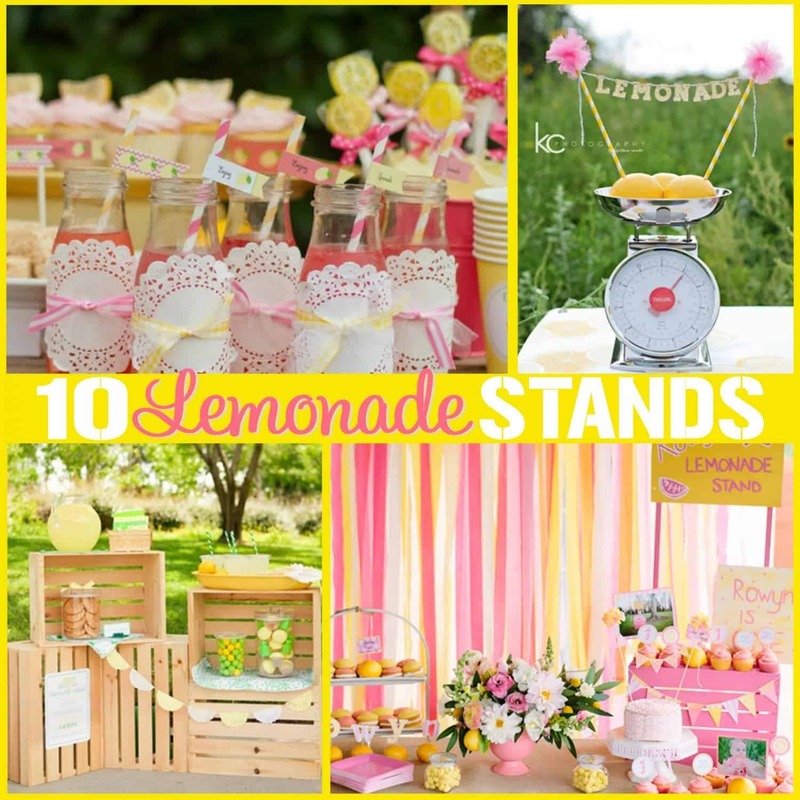 What adorable and beautiful lemonade design stands and decorations. You are so creative with all your great ideas! I love #2! I am going to set that up at my next garage sale and have my four kiddos man it. Great ideas! I love the idea of a lemonade stand for the summer. All these ideas are so creative, love the details in each. I would love to have something like this for the summer birthday parties. Those are the cutest lemonade stands! I bet the people will be delighted to buy from any of these stands! Also, they’re perfect for parties during the summer! It is so cute. I will share this post with my daughter, she always wants to have a lemonade stand. These are all such cute ideas, but I think the second one is my favorite. It’s more of a classic look and so much fun! These are all super cute. 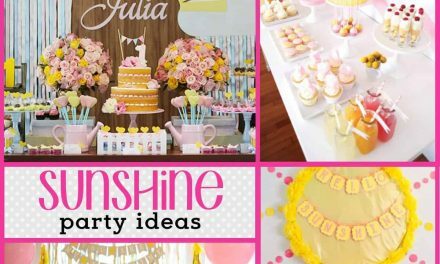 I think I might just have to have a lemonade party to use some of these ideas. I know the kids that live around here usually set up a lemonade stand in the summer we live on a fairly busy street so we get quite the traffic. I may have to suggest some of these ideas to them. Okay with this lemonade stand you are for sure generated to have people stop! 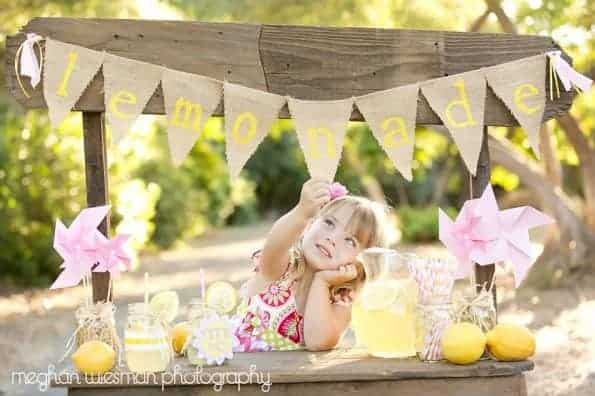 I wish my lemonade stands back in the day were this cute! Wow! It is so cute and creative! I love the glass jars. Love every detail of it. Wow with stands like these I’m sure you will have people stop to buy lemonade. They are just so adorable and creative. Such a great idea for summer! My daughter has been bugging me about running a lemonade stand in the summer. 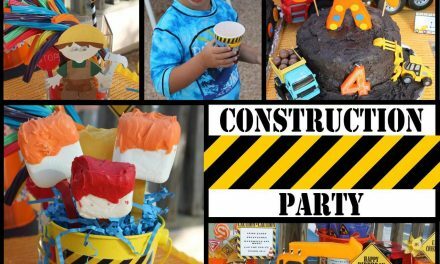 I think I can pick up some fun ways to make it the most awesome stand ever with all these party ideas!